Actions: After a calming make-up remover, facial cleanser, mask or at anytime, this lotion gives a pleasant, relaxing sensation. Reduces stress on the skin by helping reduce irritations. Acts in perfect osmosis with skin while protecting the hydrolipid surface film. Maintains an ideal moisture balance. Retains water on the surface. Activates the natural defense system thanks to the production of a natural skin antiseptic that eliminates potentially harmful bacteria. Stimulates beneficial bacteria. Optimizes the cells energetic environment and boost their activity. Results: The complexion is instantly soothed and refreshed. Pure and clean and ready to benefit from subsequent skin care products. The skin is moist with immediate and lasting comfort. Free from harmful bacteria and protects itself against external aggressions. Energized skin at top capacity. Indications: For all skin conditions. Especially those that are sensitive or extremely sensitive. Delicate skins, those that need to diffuse redness, or skins weakened by internal or external factors. 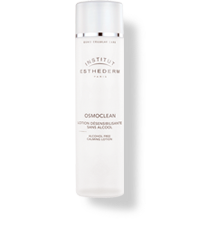 Instructions for use: Apply to the entire face and neck with a cotton pad, after using the Calming Cleansing Milk. Do not rinse.